In our ableist society, disability is treated as a flaw, as a malfunction. In “I Am Not Broken”, Fiona Patton explores the problematic assumptions about disability by abstracting the image of malfunctioning onto a robot who has been deemed to be malfunctional and is preparing for disassembly. By making this parallel, Patton explores the way that our society assumes that disabled people are “broken” and not capable of fulfilling a social role. Patton critiques ideas of bodily conformity by pointing out production lines and challenges ideas of standardized testing by pointing out that it can’t encompass the complexity of individual value. Her tale is a challenge to power structures that try to force a singular normative system and fail to recognize the power of complexity. Although using a robot for her tale, Patton’s tale is wholly folkloric. She evokes the feel and experience of folklore by using repeated phrases and a cyclical story structure. As much as this is a story about a robot’s transformations and learning about themself, it is also a tale of animals and the teachings that they impart on a wayward traveller. Patton breaks the bounds of simple definitions of folklore or fairy tales by brining her story into the galactic realm and teasing her story out with science fictional elements. Patton opens up the potential for empowerment through diversity and of power through communal activities and working together toward resolutions that work for a wider number of people. “I Am Not Broken” is a story of resistance and reflection that invites the reader to expand their understanding. As a society, we undervalue care and undervalue care workers. We tend to assume that people who do care work are doing it because they like helping people and we assume that the job is compensation enough. Even in the home, we de-value family members who provide care, viewing their care work as something that doesn’t need compensation. Care work is consistently treated as though it is not real labour and isn’t valued or compensated for. Part of this lack of value for care work stems from patriarchal beliefs that position care work as a feminine labour and therefore de-value it the same way that patriarchy de-values anything viewed as feminine. Care work has been in need to reimagining for some time. It has needed a fundamental disruption of social assumptions and a re-evaluating of the meaning of this labour. 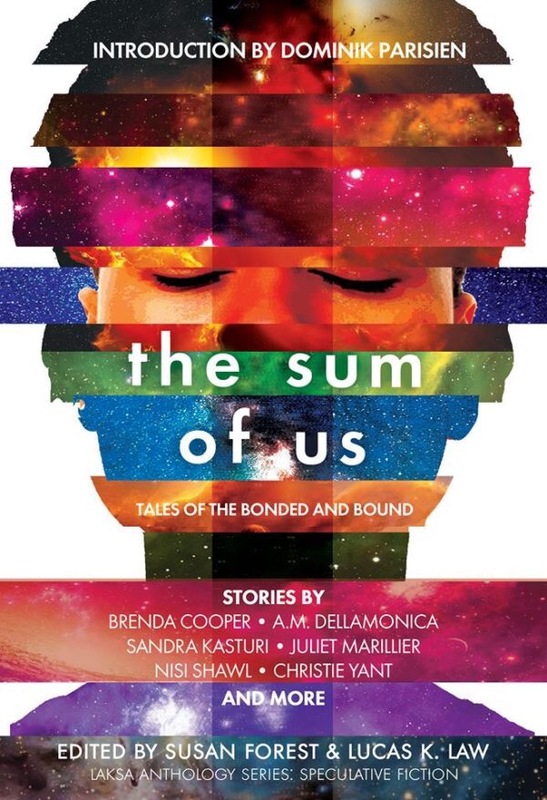 Using the medium of speculative fiction, a genre devoted to asking questions, Susan Forest and Lucas K. Law’s The Sum of Us: Tales of the Bonded and Bound brings together stories that critically interrogate the way that we imagine care and care-giving. These stories take a broad exploration of what care can mean, looking at parental care, long term care homes, social responsibilities for care, foster care, maternal care, elder care, medical care by doctors and nurses, the care relationships of pets, and even the care roles of insectile species’ (since care isn’t just a human trait). These stories examine complexities of care that are critical to this culture moment such as what is the value of care?, what difference does quality care make?, what is quality of life?, is care the role of home or the state?, what are the gendered dynamics of care-giving?, why do we de-value care-givers?, how much responsibility should parents have in the care of their children?, and what is the role of robotics in care? These are all critical questions that are in need of complex and creative answers and The Sum of Us invites readers to think critically about them. It doesn’t introduce easy answers about care-giving, but instead invites readers to explore often contrary ideas about care, asking readers to come up with their own critical questions and creative answers to the meaning of care. A review of Sandra Kasturi’s “The Beautiful Gears of Dying” in The Sum of Us (Laksa Media group, 2017, edited by Lucas Law and Susan Forest). Using second person, Sandra Kasturi positions the reader as a caregiver AI caring for an ageing woman in her story “The Beautiful Gears of Dying”. Kasturi explores the relationship between human beings and artificial intelligence (AI), which is significant since robotic assistants are currently being developed around the world with the idea that they may be able to help out in elder care. Rather than following what most authors exploring the relationship between human ageing and robots are doing, Kasturi examines ideas of intimacy and beauty between these two figures. Kastrui examines an ageing woman who is angry at the need to have a caregiver and hostile toward that caregiver, something that is normally not covered in tales about caregiving. She tells her caregiver that it can’t understand fundamental aspects of human experience and can only emulate ideas of beauty. Kasturi explores ideas of intimacy in caregiving, pointing out the relationship between trust, vulnerability and care when the unnamed elderly woman says to her robotic caregiver “You know my body better than any lover, better than any doctor, maybe better than my future embalmer”. There is something uncomfortably intimate about that statement, revealing to the reader that they will encounter this intimacy if they need a caregiver and will likely have to be exposed to someone who they don’t know. In order to reverse some of that vulnerable intimacy, the woman asks her caregiver to take off its artificial skin, to expose its mechanical realness under the human suit it is wearing. Yet, Kasturi illustrates that there is a comfort in that shared intimacy, a safety in seeing one’s caregiver revealed under all of the artificiality, even if all that is underneath the caregiver persona is wires and gears. Over the past few years, there has been a rising interest in robotic assistance for Long Term Care homes for aged populations. One of the technologies that has been developed is a robotic seal (called Paro) that emulates life and serves as a companion for aged people. Fiona Moore explores this trend through her science fictional story “Seal”, which examines the interactions between an ageing programmer, her daughter, and a robotic companion seal. Viv has consistently disparaged technologies developed for ageing populations and believed that the only valuable scientific pursuits were in space travel, but she now lives in a Long Term Care home and is experiencing that technology directly. Moore points out issues with Long Term Care homes, bringing attention to the imbalance in resources and the allocation of resources to wealthier people in the home. She highlights the costs associated with care and the resultant inaccessibility of resources for people who are not wealthy. But, most importantly, she examines ideas of surveillance and the lack of privacy in the LTC home as Viv is constantly monitored and all of her habits and behaviours noted by the nursing staff. Moore highlights issues of family involvement in the LTC home by bringing attention to elder abuse and the potential for family members to take resources away from those in the home. “Seal” is a collision of technology and the imagination of what constitutes long term care, questioning practices that are taken for granted as normal aspects of care. This episode of Speculating Canada on Trent Radio explores the idea of Artificial Intelligence. This is a venture into the world of speculation about robots, computers, machines, androids and all of those human mechanical creations. Religion (particularly when represented in fantasy) is generally constructed as something that is bounded, something that has clear boundaries and belongs to one specific group who all believe the same thing. Derwin Mak’s “Mecha Jesus” blends categories, blending religious systems and getting away from the idea that a religious figure can be exclusively the property of one group. Mak sets his story in a Shinto temple of the future, but one in which Jesus is one of the Kami. The Kami are the spirits and gods of Japanese Shintoism, but the Kami are considered boundless and can encompass any entity that is a force of creation and has influence on our world. It is therefore understandable that Jesus, a figure from Christian belief, could be adopted into Shintoism one of the Kami. 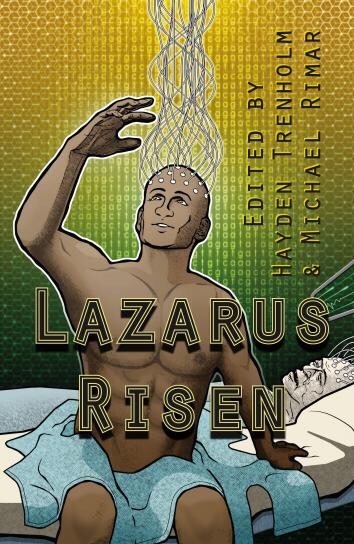 It is always challenging to explore real-world religions in speculative fiction, but Mak shows an ability to question the boundaries of religion and explore universal human themes like the quest for the ‘truth’ (and the eventual discovery that ‘truth’ is subjective), battling against discrimination and oppression, the realisation that the universe is infinitely more complex than we can imagine, and the magic of self-discovery. Mak recognizes a similarity in aspects of Shintoism and Christianity such as the idea that a man can also be a god or have something divine in him and the connection between the Catholic notion of a relic, an object that relates to a particular saint that still holds some of their power and the Shinto notion that an object that belonged to or contains part of a Kami can still hold its power. “Mecha Jesus” features a Shinto temple devoted to Jesus as one of the Kami and the principle characters in this short story are a Japanese Catholic priest who understands both the Christian context of Jesus and the Japanese cultural context of Shintoism, a fundamentalist Christian who spends most of the time at the temple trying to convince Shinto practitioners that they are worshiping Jesus wrong, and, of course, mecha Jesus himself – a robot who has taken from the principles of Shintoism that any object that holds a relic can become a shrine, making mecha Jesus himself a walking, operating shrine that holds the power of Jesus inside of it. And houses his spirit. As much as this is a story about recognising the interconnections between religions and the need to see beyond the isolating potential of religion, it is also a story about discrimination and facing social oppression. In the future that Derwin Mak creates, groups are destroying robots, considering them to be a threat to human employability and an abomination. These hate groups attack robots and those who protect them because they believe they are working for humanity. These groups, seeing robots as soulless face a critical moment when they come into contact with a robot who seems to have a soul and a group of people who are willing to defend him from persecution. As a scholar of disability studies, I am always excited to read a work of Canadian SF that really engages with ideas of disability. I have rarely encountered a short story that engages with so many disability issues as Julie Czerneda’s “Left Foot On A Blind Man”. Czerneda explores what it would be like for a robotic prosthetic to gain sentience, shaping its experience through interactions with different bodies and different roles it takes on. The RRP (Robotic Replacement Part) began its existence as a prosthetic foot for a blind man, acting both as a foot and also equipped with vision to assist the man in navigating his environment, then was retrofitted to work as an arm for a bricklayer, and finally as a nose for a chef. With each of these new experiences, the RRP gains diverse experiences of different individuals and different perspectives from the body parts it has taken over. As its exploration of diverse bodies increases, so does its awareness and personal experience. This story explores an idea that is commonly of concern to people who have received transplants: the feeling that the new part of their body is separate from them and still maintains some connection to its original host. What would it be like to feel like part of your body is separate, and perhaps altering you in small and then later significant ways? Czerneda explores that feeling in a magnified way, giving the reader a visceral experience of the feeling of bodily betrayal, and a deep internal fear of the loss of bodily integrity and selfhood. The fear of bodily control is strongest in the first host for the RRP, an elderly blind man. Though his doctors and his son try to get him to explore replacement eyes, he is reluctant – as a former artist, he wants to maintain the authenticity of his vision and sees the eyes as firmly connected to his selfhood. His son and doctors only partially respect his wishes and when he agrees to have a replacement foot made, they install it with an eye that they feel will help him navigate his environment better. Here, Czerneda explores a common trope in the experiences of elderly people with disabilities, the belief by medical practitioners and younger family members that they know better and can impose their will on the disabled body. When the unnamed elderly blind man begins to feel as though his cybernetic foot has a mind of its own, rather than believing in the authenticity of his experience, his son and the doctors have him committed. This short story is told from the perspective of the RRP after it has gained full sentience. Being an entity that has gained its sentience through being various replacement parts, the prosthetic has gained a composite selfhood from its composite bodily functions. The RRP sees itself as superior to human experience, but still enjoys and craves human interaction. Czerneda explores the difference between people who want to be upgraded and see technology as a means of augmenting what is supplied by nature and those who feel a certain authenticity of their body would be lost through the process of technological change. She magnifies the social pressure to conform to bodily norms and socially-imposed ideas of ideal bodies by illustrating characters who want to augment aspects of themselves (including sexual enhancements) and people who require prosthetics to engage with the able-bodied world. The RRP itself absorbs some of these notions of enhancement and feels that everyone should augment themselves and augment themselves in significant ways. This story is a fantastic digital biotext, exploring ideas of bodily integrity and the impact of the technological on ideas of selfhood.